Almost every civilization and culture developed its own form of fighting out of the necessity for self-defense. While Chinese, Koreans and the Japanese are known for their famous forms of martial arts, many other cultures have developed their own throughout history. The Romans, Spartans, Greeks and Vikings, among many others, developed their own. Throughout history, it appears that martial arts have risen out of various cultures and time periods independently. Read more at http://www.blackbeltmag.com/category/general-martial-arts-history/. Ranging from Aikido to Zulu Stick Fighting, there are dozens of martial arts forms from around the world. Martial arts forms can be found across the globe from America to Korea and Japan to Brazil. Various types of martial arts rely heavily on different forms, techniques and even props. 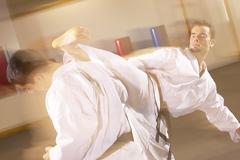 To read more about various forms of martial arts, visit http://www.blackbeltwiki.com/martial-arts-styles.